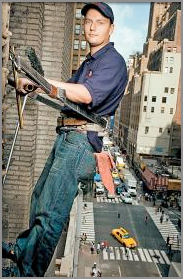 About Apple Window Cleaning, Inc.
Apple Window Cleaning, Inc. is located in the heart of New York City, Midtown, Manhattan. that window cleaning has many risks and can be a dangerous job, as well as an incovenience to you or your customers/tenants. This is why we take pride in guaranteeing quality service and efficiency. Our employees are well trained and experienced professionals. We are fully insured and bonded, prompt, never miss appointments and provide you quick quiality cleaning services. As mentioned above. We take pride in quality and professionalism. All of our employees are always neat, uiniformed, polite and friendly. They are experienced professionals who take extra care when on the job, so no damages occur to your property. Our employees are prompt, efficient and never miss appointments. Our employees are extensively trained in job safety and follow all OSHA guidelines to provide quality workmanship on every job. We require our employees to surpass compliance of accepted safe practices in the performance of their work and to provide our clients with the best cleaning experience around. Experience is a must at Apple Window Cleaning, we want to ensure that we provide our customers with a cleaning service that will leave your windows shinning until your next cleaning.